I have liked The Babylon Bee for a long time. 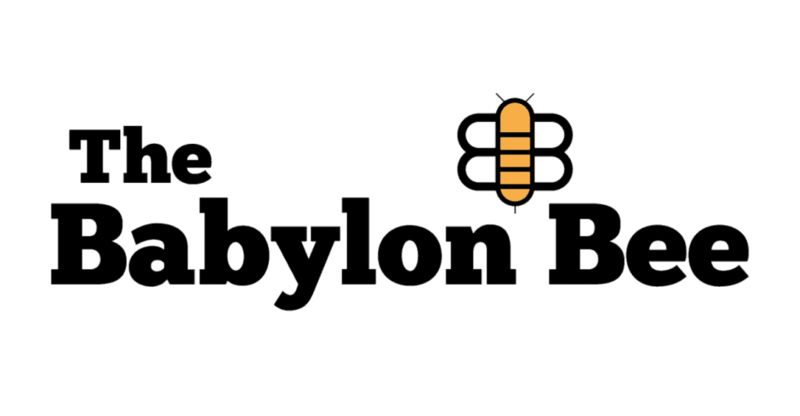 For those not familiar, The Babylon Bee is a Christian satire website, modeled after The Onion. I love the articles making fun of Arminian theology. And I love the articles making fun of Calvinists. I love that it makes fun of fog machines used during worship sets. It makes fun of Joel Osteen regularly, as well as the Jesus Calling book, The Purpose Driven Life, and Tim Tebow. Often with really sound, corrective theology woven in to the satire. It’s a website that makes fun of things, that’s understood. You might have a problem with that, I don’t. It’s not the New York Times making fun of something, it’s The Babylon Bee. I’d be honored if the Bee made fun of me someday. That’d be a more meaningful “you’ve arrived” moment that the elusive blue check mark on Twitter. The concern I have with the Bee is they are recklessly making fun of and running over marginalized people in a way that dishonors Christ. Some who are struggling with traumatic issues that the writers of the Bee have never had to struggle with, and others who are undergoing serious injustice that the writers of the Bee have never experienced. Most of us are accustomed to the polarized dichotomy that dominates the political landscape today. You state where you stand on issues like abortion, gender, sexuality, refugees, immigrants, police brutality, and of course, Donald Trump. Grenades are then lobbed back and forth and carnage ensues. No one is ever wrong because they always have their online tribe there to pat them on the back. For a while, it seemed like the Bee made a concerted effort to transcend the juvenile nature of these debates. For every article I saw that had a Republican bent to it, there was another one making fun of Donald Trump or supporting a traditionally Democrat issue like immigration reform. The Bee was stinging both sides, as it should be. But recently the Bee is getting sucked into the juvenile grenade tossing, using its satire as a means of patting its own tribe on the back (and getting all those likes are shares from their tribe) rather than using it as the transcending and corrective voice it can be. And the sporadic posts making fun of Trump or the wall can no longer rationalize this trajectory. …there’s a hetero member of the patriarchy who wants to jump off a bridge. Keep fighting the good fight, because we’re moving toward a better world. Case in point: this person is heterosexual, Caucasian, male, cisgender, able-bodied, and wishes he had never been born. These articles just make me sad. Not because of the point they are trying to make against progressives, but because of how insular they are. They are the same knee jerk reactions you’d expect to see on any random opinion website run by non-Christians. I’m sad because the Bee attaches Jesus to its views, so now non-Christians have even more fuel to think the Church is unloving and unjust. The Body of Christ is broad and diverse, and these perspectives are anything but. There are valid concerns within the movement for women’s equality and rights. Very valid concerns. Sit down and listen to a woman and hear for yourself. It doesn’t mean that the “far left” or whatever you want to call it is right about everything, but to throw the whole topic out as utterly ridiculous is reckless and unloving. The articles don’t feel like you’re making fun of the political topic, they feel like you’re making fun of women. It’s like telling women who have been abused and overlooked that they don’t matter, all in the name of Christ. A friend of mine is gay. He grew up in the Church. He told me one of the greatest problems is our definition of masculinity is all about football, cars, and being macho. Because this is our definition of masculinity, if you don’t fit this, you’re looked at as less than a man. Being treated like less than a man contributed to my friend’s gay identity, as there wasn’t a definition of Christian masculinity given to him in the church that fit him. King David danced, wrote poetry, and played the harp, things that culture and the Church today would not identify as masculine. This isn’t to say there aren’t things that are masculine or feminine, but the solution isn’t to regress back to blind grenade throwing, trying to fight fire with fire. Or to deny the existence of white privilege. Is the topic always addressed tactfully from “the other side”? No. So is that an excuse to not handle it tactfully in response? The Bee thinks so. How does this help? Obviously white privilege is real (and needs to be understood properly) and is a contributor to the incredible systemic sin that divides America and the Church. So instead of being in loving community in a way that brings redemption and constructive solutions to those who don’t share this privilege, let’s just make fun of them instead. I have no doubt these posts have increased the Bee‘s readership. This tribe loves to post these sorts of articles that pat their views on the back. But if the increase in readership is exclusively Republican white males, hasn’t the mission failed? At that point, you’ve just become another resounding gong and clanging cymbal in a world already full of arrogant, insular noise. Thanks, Noah. I haven’t been keeping up with the BB the last 2 or 3 months, so I guess I hadn’t noticed the shift. I appreciate the heads up. You’re welcome, Tim. It’s sad because it has done so much really funny stuff over the years, and I always thought that it did some good with it’s articles too, using the satire too draw people closer to the truth. But I feel it’s gone off the rails in my opinion. I can’t share their articles anymore with the association of their name and this sort of approach. Comedy always comes by exaggerating a stereotype or pattern to a logical extreme. It shouldn’t only be allowed when it makes jokes about white, hetero, protestant male stereotypes. Comedians have begun to avoid college campuses because of politically correct crap like this. Some of the best are quitting the industry entirely. Noah, I get your point, but you are wrong. Yes we need to be sensitive to people who have been wronged. But EVERYONE today has been wronged. Yes, there are some things where being white is an advantage. There are things where being male is an advantage. There are also places where being female is an advantage and being minority is an advantage. This is by far the most fair country in this history of the world – albeit still fallen. We have to face it, the world isn’t fair. But comedy isn’t about fairness. It’s about exaggeration. When Chris Rock or Eddie Murphy makes a joke about their own race — the content is just as offensive as if it were made by a white man…. but people treat it differently. That shouldn’t be. When we’ve reached a point where the only people you can make a joke about are rich white hetero cis-gender protestant males, then you might as well stop doing comedy — because it is offensive and wrong to them just like it is any other group because it’s based on identity politics and stereotypes. The reality is that the stereotype that all white people or cis people or protestant people or rich people have it easy — is simply not true. EVERYONE struggles. Some of the most depressed people I’ve ever met are incredibly successful people who got rich at a young age and didn’t know how to fit into the world and contribute from that point forward. Spot on Noah. I’ve had a similar reaction in the last few month. Well written. I clicked through a few of those Bee articles, and I think Noah is correct about the unloving nature of the “jokes”, if we can call them that. Normally satire highlights where one side of a spectrum has gone too far, suggesting that moderation in the other direction is appropriate. Unfortunately the Bee picked a few of the worst failings of the church to try and defend with these articles. People have said exactly what was written in some of those articles, in full seriousness, to great harm. So I don’t think they’re satire as much as they’re encouraging some regrettable positions that current Christians hold. The way some Christians handle gender and sexuality, with judgement and hatred, makes it hard to believe Jesus has much impact on their lives.